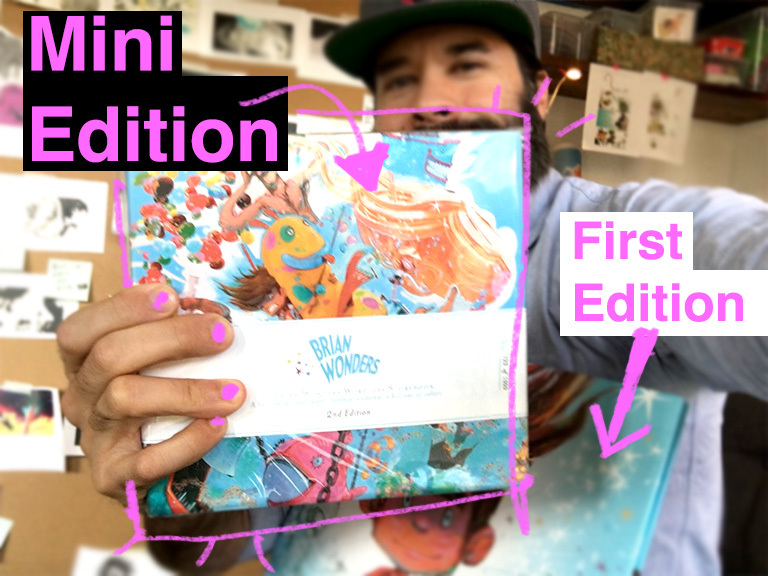 2nd printing of the Brian Wonders Storybook! 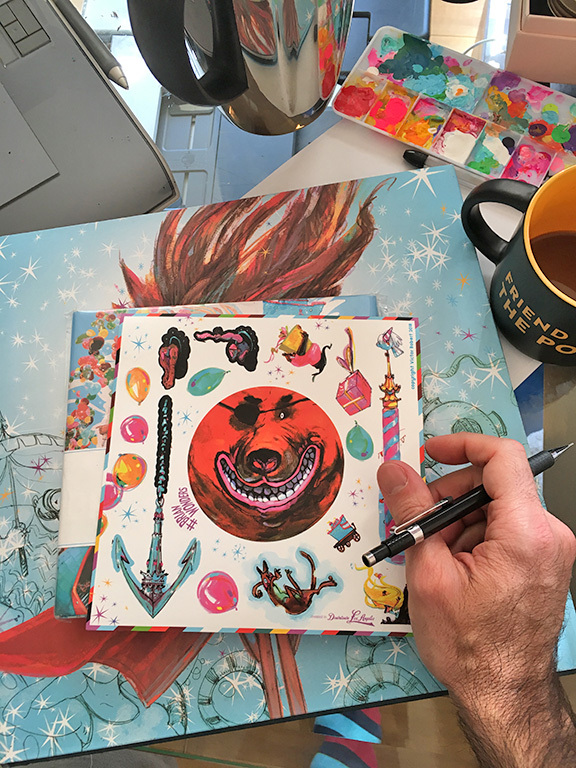 This new edition will be a super compact version of the original storybook and will include a 4-page set of colorful new illustrated stickers. I’ve been working on these for a while now and am excited to start sharing some of the work that went into this new batch and to finally start rolling these little guys out! Pre-selling here. These were supposed to release over the holidays, but I think it has been worth pushing their release… I can be a little obsessive about details and it took me a while to get those just right. This is the dust jacket proof, which will be French-folded onto the hardcover. Q: Victor, you already released a Brian Wonders Storybook, why are you releasing a second batch and doing it all over again? VR: Good question. I couldn't help it. With the First Edition Brian Wonders I printed a micro batch of 250 copies -- each storybook came individually signed, numbered with a custom-made slipcover, and for a bunch of reasons they went out to a very limited audience of family, friends, and collectors. But I love these books so much that I really want to see them in more people's hands. So I decided to run a 2nd printing, this time printing 1000 copies. As an independent artist, I had to change a couple of things in order to make this 2nd run feasible. This 2nd run of storybooks have been repackaged and streamlined and I hope they do reach a wider audience. Q: Aside from the number of copies, did anything change from the First Edition to this Mini Sticker Edition? VR: Yes -- as the name implies, this Mini Edition batch is super compact and smaller in size -- the original storybooks are 12" square, and these new ones are 7" square. I also went through and made a few adjustments to the illustrations... couldn't help it... though most illustrations remained unchanged. This new batch will also include a set of super cool stickers! Q: Oooh! I love stickers. Tell me about them. VR: These stickers are special -- they are spot illustrations that I designed to work into the pages the storybook… they are a little bit magical because once they are dropped into the illustrations, their edges magically disappear and they become part of the illustrated spreads. I loved stickers as a kid and thought these would be a cool way of making the storybook interactive. Each storybook includes 4 sheets of stickers, totaling over 50 stickers; they are non-permanent and can be reused. Q: Did you add words to this new edition? Or is the storybook still a book without words like the original? VR: I love the idea of a storybook without words where kids can imagine, tell, or write their own stories, so I kept this edition without words as well. Maybe in the future, I will release an edition that includes words here and there. Q: Are you having a launch party for this? VR: Yes, but that’s in the works. Probably a summer time thing. At the moment the storybooks are pre-selling online here. I’m about a month out from starting to ship. 1 of many many color proofs working with my brilliant printer in MN.